Napoleon the First recognized both the revolutionary identity of Pontivy and its strategic position. The two rivers, the Blavet and the Oust opened the way for travel and the transport of goods in the directions of Nantes, Brest and Lorient. At the beginning of the 19th century Napoleon’s projects for the Pontivy region were colossal. Orders were given to canalize the waterways and to construct military, judicial, administrative and religious buildings worthy of an important urban hub. Work commenced, but when the empire collapsed there was still much to be done. At the end of the century Napoleon the Third finished what had been started with the arrival of the train and the construction of the church of Saint-Joseph. 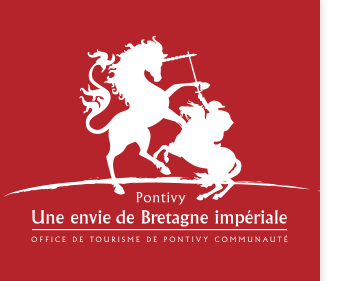 In 2015 the Pontivy Community Tourist Office obtained the label: Itinéraire culturel européen, destination Napoléon. Napoleon’s project to connect Nantes to Brest through the interior of the country encountered enormous difficulties. However, this massive project was completed in 1842 at which time the canal was a 360-km waterway with 237 locks. The Pontivy region is crossed on both sides by the canal from Nantes to Brest. To the west of Pontivy, the Blavet was channeled, interrupted by the dam and Lake Guerlédan. To the east of Pontivy, it was necessary to make a junction between the Blavet and the Oust. This is the artificial part of the canal. It is fed by the Hilvern channel and the Bosméléac dam (Côtes-d'Armor). 52 locks succeed one another on this part in a formidable ladder punctuated with ponds until linking with the Oust. 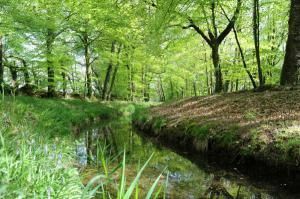 The Hilvern Channel, designed to supply water from the canal from Nantes to Brest, winds through the countryside for 62 km between Lake Bosméléac and Saint-Gonnéry. Bordered by many species of trees, its towpath lends itself to beautiful hikes. Planned to bring one third of a cubic meter per second to the canal, its landfill valves and weirs regulate the river during periods of flood.